·I am thankful that even if I never run another step in my life, I have already run farther than most ever will. ·I am thankful that despite my injuries, I am still here breathing and capable of savoring so many things that life has to offer. ·I am thankful for all of the quirky things that make my son Jaden for without him life would be far less interesting. ·I am thankful for the most amazing smile that rests on the face of my daughter Thalia. I am convinced her smile is capable of changing the world. 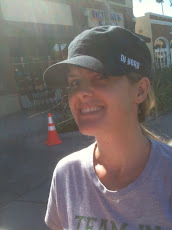 ·I am thankful that my wife was stronger than cancer……twice. ·I am thankful that a recent cancer scare for my wife was simply a scare and that today she remains cancer free. ·I am thankful that my wife has had to power to forgive the many mistakes I have made along the way. ·I am thankful my father taught me how to work hard, laugh hard, enjoy challenges and how to fight back. ·I am thankful for an amazing job that never allows the opportunity of boredom. ·I am thankful for a mother that taught me compassion and exactly what having a big heart really means. ·I am thankful that my life crossed paths with Alison Chavez years ago because without saying a word to each other face to face over the past few months…..she has taught me what true strength is. ·I am thankful for all of the folks that helped me to raise over $20,000 this year towards finding a cure for cancer…..many of whom are also responsible for helping me raise the $135,000 life to date. ·I am thankful to Team in Training for allowing me to better myself while having the opportunity to impact lives. ·I am thankful to all of the folks on the Fall 2013 Westside marathon team for taking a leap of faith, believing they could do something they once thought impossible and for allowing me the chance to maybe see things a little differently. ·I am thankful that I have a second chance to be the Dad that my daughter Tiana deserved when she came into my life when she was 5 years old. ·I am thankful to many friends….. both real and virtual for being quite remarkable. This list could keep going but I feel back on track. I hope you all have a very Happy Thanksgiving and take a moment to look past all the challenges life has to offer to see all of the blessings that surround you. Cheers.